Very cool, Corinna! Thanks so much for sharing this. Who'd have thunk?! Interests:Ghoststudy...lol, I live for it. Hanging out with my family. Cleaning, cooking...blah blah blah, the usual stuff. This is a prime example of getting your pics developed by a cheap place. They accidently got something on the negative. how nice.I think he sneezed on it. They are lucky that it didn't ruin my kids face. LOL. But if you notice to the left of her, The BLOB on the cabinet, is water on the negative before it was printed. You see what you want to see- I've discovered that I can look at almost any photograph and see some sort paranormal image. I'm talking about not very obvious things, but really small things that really are nothing. I know that the ghosts in authentic photographs usually don't just automatically pop out of the photograph when you look at it, but sometimes if you just stare at a photograph for a long time and you are specifically looking for a ghost, etc... your eyes begin playing tricks on you and you see whatever you want. I'm relatively new here, and really agree with that. Many pics posted elsewhere on the boards are just that, IMO. actually I was at that site this morning and the video was still there. Darkone did some pretty interesting research. ISeeThruYou, if you look closely the looks to be like the lower have of a skull in you picture. It's just the steam and (is that a bench?) a piece of furniture, and they appear to be making something that isn't really there, but it is pretty cool!! Not fabricated, but a very good example on how trees and gaps in the leaves can play with the mind. This is a photo of a movie set that is currently filming. I reduced the photo by half so it doesn't take up so much space here, but you can still easily see the face. ETA: There is a lot of smoke around during the filming of this particular shot, just in case you're wondering what on earth is going on with the haze effect. Edited by Araine, 01 March 2005 - 08:23 PM. Sorry about the darkness of the picture everyone, but it's all I've got. If someone wants to lighten it up a little, be my guest. 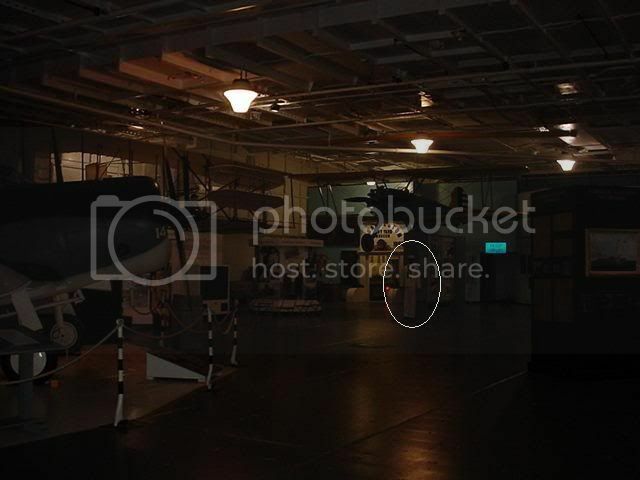 This picture was taken by myself on the Flight Deck of the USS Yorktown, and when I first saw this picture, my breath caught in my throat. Then I realized that all I was looking at was a WWII Navy Uniform on display, being worn by a blank mannaquin. Edited by Off Duty Cop, 17 March 2005 - 03:26 PM. That is cool regardless. I can see where you may have mistaken that for a ghost. that would've spooked me at first too, even if it is just a mannequin, it's creepy looking! No, I would have not thought that it was phenomena because the image is too complete - you can even see the shoes, and there is no other phenomena manifesting. I don't know about you guys, but it seems to me that when I am looking at something real there is seldom only one item to view in the pic. Yes, but you have to remember, who is to say that a spirit can't appear "complete"? As others have stated on this site, ghosts don't necessarily manifest themselves as orbs and energy streaks all the time. 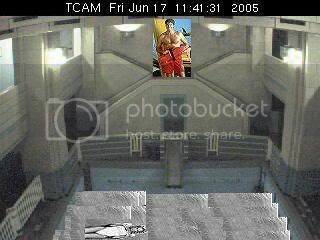 Others have discredited some interesting photos/cam caps, because the subject looks too "solid". In my opinion, too many people buy into the stereotype that all ghosts appear transluscent or as balls of energy. I've read countless stories where spirits were mistaken for the living. How could you confuse a ghost for a living person if you could see right through it? True, the full body apparition picture does seem to be our "White Whale", but I must believe that it exists, and is possible to obtain. i agree and i wont give up till i get one(full bodied app) so the maniquin in the pic may not be a real app but it sure would have caught my attention thats for sure, just one question(probably nothing but)who are the 2 guys standing towards the back? i thought it may have been a pic/poster or something! perhaps you can clear that up for me!!! Edited by deb_493, 21 March 2005 - 01:50 PM. The two guys in the back are Wilbur and Orville Wright (The first men to successfully achieve manned flight), and they are nothing more than part of a cardboard cut-out display. Edited by Off Duty Cop, 21 March 2005 - 04:02 PM. 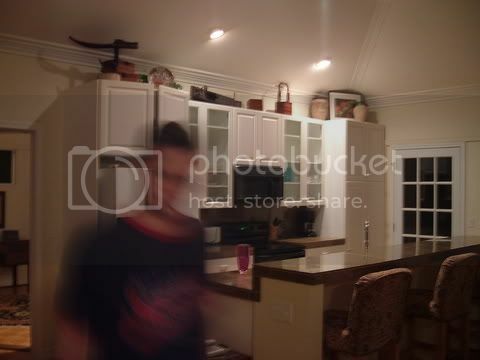 Here's a terribly fabricated photo created on a digicam by somebody walking through the shot on a long shutter speed. But it doesn't actually look real. Edited by Darklighter, 16 June 2005 - 05:57 AM. here's my first attempt ever...got really really bored so thought i'd give it a shot. i used two photos..both of which i took in goliad texas. one is of a battle reenactment ..and the other is looking through a pavilion window at the actual battle site. That looks really good Darwin! I would have thought that one real if you hadn't said anything! i did another with a cemetary pic. i was originally going to go for a non definative white blob sort of effect..but went with transparent weeping lady instead. she might be a little too visible. Edited by darwin, 05 July 2005 - 11:14 AM.